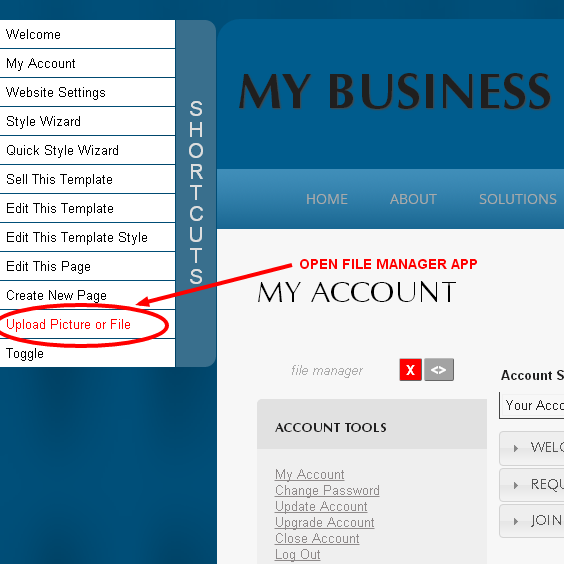 Learn how to use the Monkey Business Filemanager app to manage all the files and folders on your Monkey Business website. Easily create folders, upload and download files, crop images and much more. Using the File Manager, you can work easily with the files you use on your website. With it you can easily create folders, upload files, download files, organize files, and perform a host of other operations you need to work smoothly. 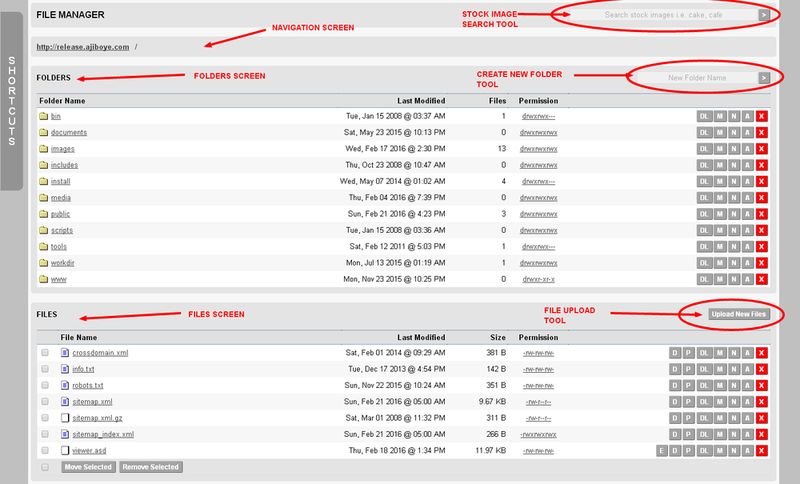 The File Manager is divided into 3 main screens. The Navigation Screen shows your Current Location in the File System, starting with your website address, with links to each Folder after that. You can click on each link to quickly jump to it. The Folders Screen shows all the Folders in your Current Location, with options to Download, Move, Rename, Show Address or Delete each Folder. You can also create new folders by using the Create New Folder tool. The Files Screen shows all the Files in your Current Location, with options to Duplicate, Preview, Download, Move, Show Address, Rename or Delete each File. Additional for Images, you will see image Dimensions, and options to Resize, Crop, Edit, or Watermark the image, while for webpages, you will see an option to Edit the file. You can also upload new files by using the Upload Files tool. The top-level of your Monkey Business Filesystem is organized into major folders based on file type. You cannot create, save, or upload files into the top-level of the Filesystem, or any System Folder. Always upload and save files into the right Folder to avoid unexpected errors and behaviors. For example, webpages must be saved in the documents folder, and pictures should go in the images folder. Click on any Folder name in the Folders Screen to navigate into that Folder. Click on any link in the Navigation Screen to navigate back and into that Folder. To create a new folder, simply navigate to the Folder you want to create the new Folder in, then use the Create New Folder tool, found in the Folders Screen. To upload new files, simply navigate to the Folder you want to upload files into, then use the Upload New Files tool, found in the Files Screen. Use the Stock Image Search tool to quickly find free stock images and icons to use on your website. Results come from over 50 million images from Flickr and Gettys Images libraries, and 400K icons from Monkey Images. Include the word Icon in your search phrase to find icons. 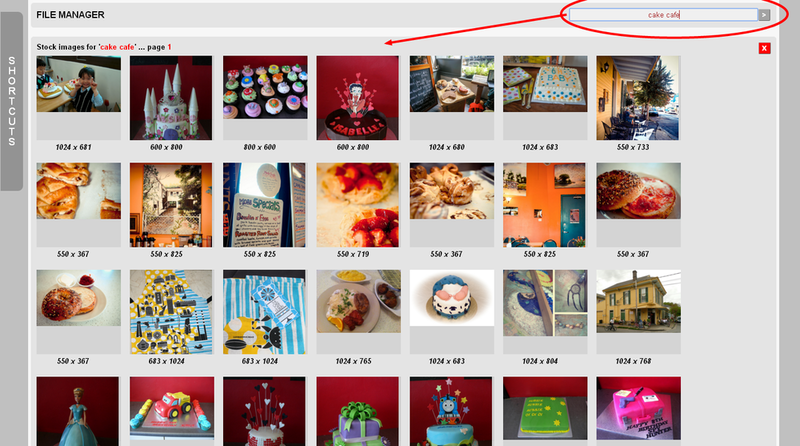 Click on any image in the result to Download or Embed it in your content composition. Mouse over any image for more options like Preview, Download, or Save.